Mr. Nicholas Andrew “Nick” Mathis, 27, passed away on Friday, February 25, 2011, in Century. Mr. Mathis was a native and lifelong resident of Century. He was an avid fisherman, loved racing and shooting pool, enjoyed helping others and being a help mate for his father. He attended the Baptist church. Preceded in death by his grandparents, Tom and Annie Mae Mathis. Survivors include his father, Bobby Mathis of Century; his mother, Sabrina Medlock of Orlando; a brother, Dennis Mathis of Century; his grandparents, Carlton and Susie Medlock of Milton, and Wilbur and Margaret Levins of Byrneville; a special uncle, Jimmy Mathis of Century; a great-aunt, Chiquita “Coot” and Jr. Mathis of Century; and a number of aunts, uncles and cousins. Funeral services will be held Wednesday, March 2, 2011, at 11:00 a.m. at the Petty-Eastside Chapel Funeral Home in Atmore with the Rev. Dervin Spears officiating. Burial will follow at Flomaton Cemetery. Visitation will be held Tuesday, March 1, 2011, from 6-9 p.m. at the Petty-Eastside Chapel Funeral Home. Pallbearers will be Zack Sims, Jeremy Young, Little Stevie Pace, Damon Word, Josh Barnes, and Lloyd Curtis. There were no serious injures when a vehicle collided with a sidewalk railing Monday afternoon in Century. The vehicle stuck the railing along North Century Boulevard near Jackson Street about 1:35 p.m. before striking a sign pole at the Southern Pit Stop convenience store. 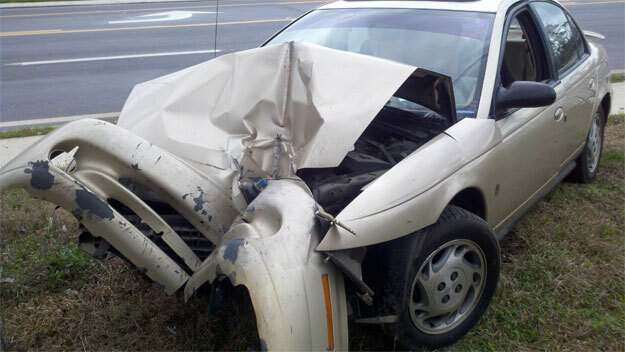 The Century Station of Escambia Fire Rescue and Escambia County EMS responded to the accident. Submitted photos for NorthEscambia.com, click to enlarge. Deputies have identified a suspect in a double shooting over the weekend in Century as their investigation progresses today. According to the Escambia County Sheriff’s Office, someone opened fire about 2 a.m. Saturday at the Town of Century’s Habitat Building on East Pond Street. Ieshia Mitchell, 20, of Century, was hit in the left knee and later airlifted to a Pensacola hospital, and 19-year old Register Yelder of Atmore was shot in the leg. Stacy O’Neal Johnson, 18, of Atmore, was injured when he was hit in the head with a bottle during the incident. Sheriff’s investigators have identified a suspect in the case, and they are in the process of obtaining an arrest warrant for the individual, according to spokesperson Sena Maddison. The suspect, she said, will face a felony charge of firing into a crowd. Deputies say a gun was recovered at the scene, but they are not yet sure if it is the weapon used in the shooting while 75 to 125 people were at the early morning party. Further details have not been released by the Sheriff’s Office. Anyone with information about the double shooting is asked to call Gulf Coast Crime Stoppers at (850) 433-STOP or the Escambia County Sheriff’s Office at (850) 436-9620. Monday, the U.S. Marshals Florida Regional Fugitive Task Force arrested a man suspected of the Saturday robbery of an Escambia County supermarket liquor store. Clifford J. Faust, 50, is thought to be the gunman in a video using what is believed to be a handgun robbing a Mobile Highway Publix Liquor Store. He fled on foot with about $900. The Task Force received a tip that the person believed to be in the video was possibly staying at the Best Value Inn located on Davis Highway. At about 3:15 p.m. they arrested Faust without incident when he was spotted walking out toward the parking lot. At the time of his arrest, neither a gun nor the missing $900 was found. Faust was taken to the Escambia County Sheriff’s Office for questioning before being booked into the jail. According to the Florida Department of Corrections, Faust had been released from Liberty Correctional Institute back in November of 2010 where he served time on grand theft and larceny charges. Pictured: Surveillance cameras captures this image of a robbery Friday night at a Publix Liquor Store. Many of us are just plain lazy — that’s the finding of a new report released by the Centers for Disease Control and Prevention. Adults in Escambia County, Alabama, are among the laziest in the United States, while Escambia and Santa Rosa County residents are a bit more physically active. Americans who live in parts of Appalachia and the South are the least likely to be physically active in their leisure time, according to estimates released recently by the CDC, with some times over one-third of adults reported getting no physical activity or exercise other than at their regular job. In Escambia County, Florida, the report shows 26.1 percent of adults are physically inactive, while in Santa Rosa County, that number is 22.9 percent. 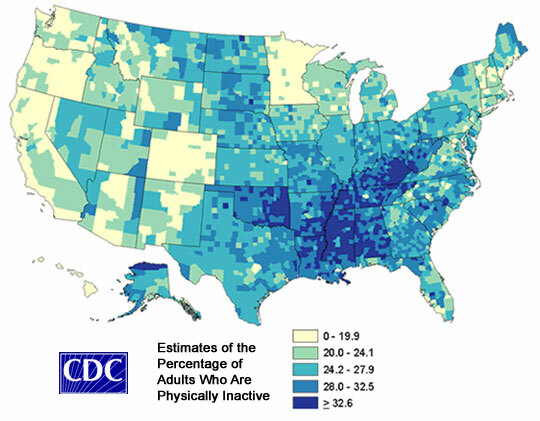 In Escambia County, Alabama, 33.7 percent of the adult population is physically inactive — among the laziest people in the country, according to the CDC report. The CDC survey found that 25.4 percent of U.S. adults did not spend any of their free time being physically active, including activities such as walking for exercise, gardening, golfing or running. 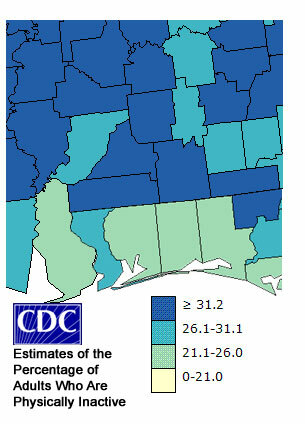 Pictured inset: This map shows the CDC’s estimates of the percentage of adults who are physically inactive in the North Escambia area. Pictured below: The national map from the CDC shows a pocket of physically inactivity in parts of Appalachia and the South (in the darker colors). More rain is possible into the evening in the area. Tonight: Scattered showers and thunderstorms before midnight. Some storms could be severe, with damaging winds. Cloudy, with a low around 49. North wind between 5 and 10 mph, with gusts as high as 20 mph. Chance of precipitation is 40%. Tuesday: Sunny, with a high near 69. North wind between 5 and 10 mph. Tuesday Night: Mostly clear, with a low around 44. Northeast wind around 5 mph. Wednesday: Sunny, with a high near 73. East wind around 5 mph. Wednesday Night: Mostly clear, with a low around 42. East wind around 5 mph. Thursday: Mostly sunny, with a high near 73. East wind between 5 and 10 mph. Thursday Night: Partly cloudy, with a low around 48. East wind around 5 mph. Friday: Partly sunny, with a high near 73. East wind between 5 and 10 mph. Saturday: Scattered showers and thunderstorms. Cloudy, with a high near 71. Chance of precipitation is 40%. Saturday Night: Scattered showers and thunderstorms. Mostly cloudy, with a low around 42. Chance of precipitation is 30%. The Town of Century has started the installation process on 1,000 new automated water meters in an effort to eliminate billing problems and increase revenue. Each customer’s existing meter will be changed out for one of the new automated meters. The process is expected to last six weeks or more. According to Mayor Freddie McCall, it is possible that open holes will be left around existing meters from one day to the next, but holes will be properly marked and barricaded. He asked that residents be careful around work areas. Much of the $137,386 cost of 941 water meters from Datamatic, Ltd. will be recouped in additional billings due to increased meter efficiency, according to the company. The current automated meters have been plagued by misreads, billing mishaps and continual customers complaints — a system that McCall termed a “headache”. With the new Mosaic Firefly water meter system, the town’s meter reader will never leave his vehicle. He will simply drive block to block as the meters automatically report their readings wirelessly. For an estimated $30,000 in upgrades at a later date, the new system wold be capable of automatically reporting water meter readings from across the town without human intervention. With the completely automated “mesh” system, each meter would communicate with neighboring meters, eventually relaying a report from each meter back to city hall. That method, Devane said, is much more cost effective than sending out a human meter reader. In addition, daily reports could pinpoint customers with leaks, backflows, usage on inactive accounts and fraud. 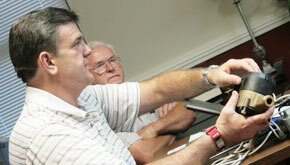 Datamatic also manufactured the current gas meter reading system for the Town of Century. McCall said there is no plan to replace that equipment at this point, but it would eventually be phased out for a newer system like that proposed for the water meters. The new water meters would have a 10 year guarantee, including an internal battery. Each meter would store hourly information for 320 days. 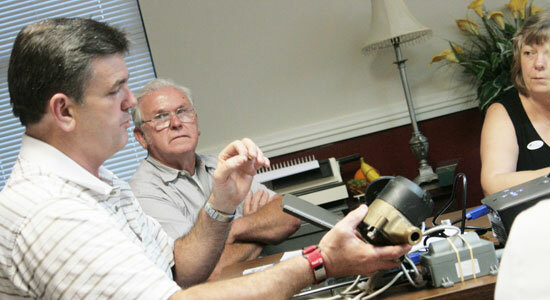 The new meters will also be lead-free, a standard required of new meters in Florida by 2012. The $137,386 purchase will pay for itself in less than two years, according to estimates by Dan Devane, regional sales manager for Datamatic, Ltd.. He estimated the town would realize an additional $83,125 in additional billings due to increased meter efficiency and about $2,200 per year in labor savings. Pictured top: Datamatic Regional Sales Manager Dan Devane describes a new water meter system as Century Mayor Freddie McCall and Council President Ann Brooks look on during a September, 2010 meeting. NorthEscambia.com file photos, click to enlarge. Saying the state needs to attract business and pay back the feds, a House panel last week approved an unemployment compensation bill that cuts benefits to workers and reduces taxes on employers. By a 12-5 vote, the House Economic Affairs Committee approved HB 7005, a major re-write of state unemployment compensation rules that reduces the duration recipients can collect, shifts the burden of proof in appeals and ties the length of benefits to the strength of the economy. The length of time the state would pay benefits to the unemployed would go from the current 26 week maximum to as little as 12 weeks depending on the unemployment rate if the House version of the bill becomes law. The Senate has a bill (SB 728) seeking to make it less likely that the state will pay out unwarranted unemployment compensation, but the Senate measure doesn’t include the reduction in the length of eligibility as the House does. The House measure now is ready for the floor with lawmakers scheduled to start their regular session March 8. The committee vote Friday came after more than an hour of testimony from business groups, who said the changes would create jobs and help struggling businesses survive, and critics, who said the measure places the burden of replenishing the state unemployment fund squarely on the backs of the jobless. Democrats on the panel criticized the effort, saying the depth of the recession has made it especially difficult for unemployed Floridians to find work and provide for their families. In the rush to shore up the state’s economy, lawmakers are overlooking the human element. The state’s unemployment reserves were exhausted in August 2009. Since then, the state has borrowed more than $2 billion from the federal government to be able to pay unemployment claims. -Reduce the maximum duration of state benefits from 26 to 20 weeks. -Tie the length of benefits to the state unemployment rate. Benefits would last 20 weeks if the unemployment rate is 9 percent or higher, but would fall as low as 12 weeks as the economy improves. -Make it easier for employers to deny benefits based on worker misconduct by expanding the definition to include chronic tardiness and absenteeism. -Shift the burden of proof away from workers in appeals of benefit rejections, by striking changes placed in the law in 2003 that require conflicting or uncertain assertions to be ruled in claimant’s favor. -Roll back employer contributions by 10 percent. The 12-5 vote was along party lines, with the Democrats against the bill. Also testifying Friday was Randall Webster, a former affordable housing executive who has been out of work for more than a year and said he wanted to give lawmakers a face for their discussion. Backers of the legislation said the ultimate goal should be to give legislators a paycheck so they don’t need an unemployment check. Karen Woodall, an advocate for the unemployed with the Florida Center for Fiscal and Economic Policy, said Florida already ranks near the bottom of states in terms of benefits paid and the percentage of unemployed who qualify for benefits. To further reduce benefits to shore up the trust fund was “unconscionable,” she said. Woodall also unsuccessfully urged panelists to amendment the bill to allow workers to report their last two quarters of employment when calculating benefits. The revision would make benefits available to additional workers, many of whom are employed in agriculture, whose jobs are more seasonal in nature, and sometimes can’t collect unemployment. Florida is among a handful of states that do not base unemployment payments on the last two quarters. Changing the law would cost employers about $51 million a year. Backers of the bill include several business organizations, including the Florida Chamber of Commerce, Associated Industries of Florida and the Florida United Businesses Association. Today is the last chance to save one percent on your property tax bill. A one percent discount when you pay your real estate and tangible personal property taxes ends on Monday, February 28, according to Janet Holley, Escambia County tax collector. Over $38 million — about 18 percent — of the tax roll remains unpaid. 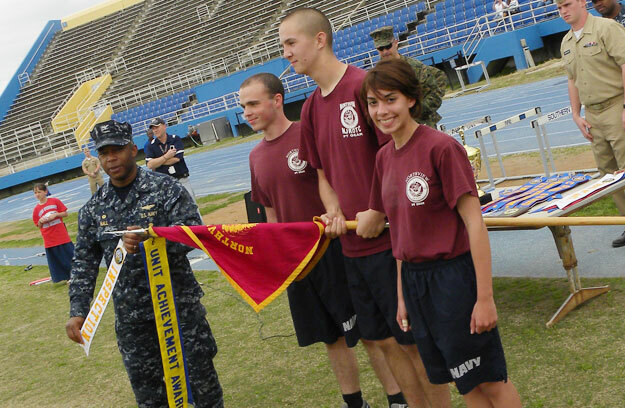 Northview High School’s NJROTC recently participated in a drill meet at Southern University in Baton Rouge, Louisiana. 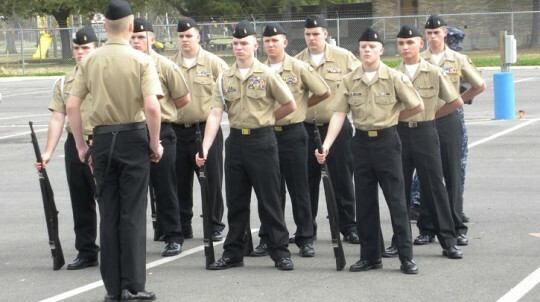 The unit competed in multiple events which included a personnel inspection, academic test, basic and exhibition drill and physical fitness. Out of 16 schools from Florida, Mississippi, Alabama and Louisiana that competed in the meet, Northview finished fifth overall. The unit was third in the personnel inspection, fifth in the armed exhibition drill and sit-ups and sixth in unarmed and armed basic drill. “Performance by the unit was excellent and was the culmination of a lot of hard work over the past several weeks by each cadet that competed. They represented Northview and the community in an outstanding fashion,” said Capt. Charlie Code, instructor. Pictured: The Northview High School NJROTC participated in a drill meet at Southern University in Baton Rouge, Louisiana. 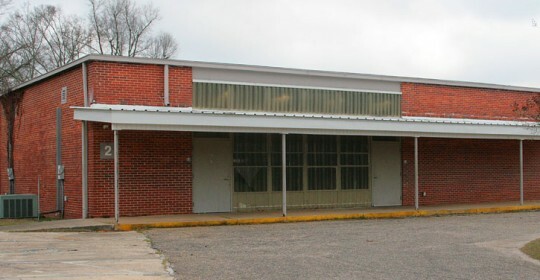 Submitted photos for NorthEscambia.com, click to enlarge.